Every wonder about our Detox + Slender body wrap? Ashley at Body Nouveaux spa was amazing!! She was very accommodating. The entire spa is beautiful, relaxing and extremely inviting when you walk in. You’re greeted by smiling faces at the beautiful appointment desk and are offered a beverage right away. As far as the wrap goes, it was truly a lot of fun!! Ashley made the entire process light hearted, funny, and honestly an all-around good time! She wrapped me up like a mummy then helped me “penguin walk” (basically waddle) over to the elliptical to begin my hour of “feet shuffling” (as I was wrapped up nice and tight, there wasn’t much for actual walking haha.) She set me up with my favorite show on Netflix and allowed me to just binge watch for an hour as I did my feet shuffling. She came in every 20 minutes to re-baste me with new (and warm) mineral solution. Then it was right back to feet shuffling and binge watching Netflix. As soon as the wrap was finished and she unwrapped me, I felt a huge sense of relaxation and peace. I also found that my leggings were loose on me (my leggings!!!) I couldn’t believe after just one hour-long session I felt so relaxed and could visible see the effects right away. She warned me that I may be worn out from the process, and boy was she right!! I slept wonderfully last night and woke up feeling rejuvenated and refreshed. My skin is seriously glowing today and feels so soft!! 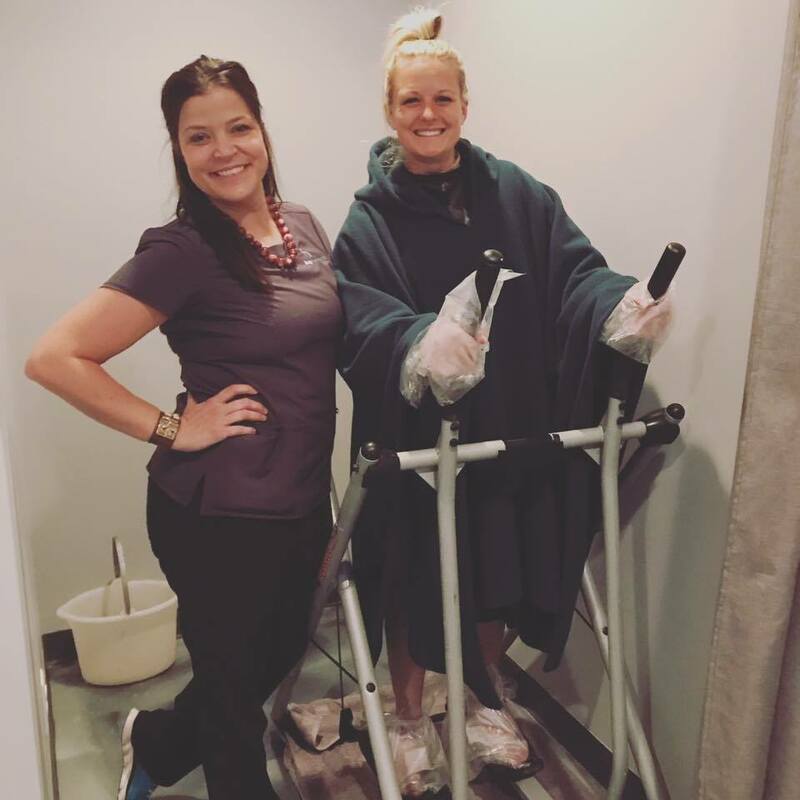 I absolutely loved my experience at Body Nouveaux!!! I will definitely be coming back for future wraps and bringing my girlfriends along too! I was so excited to get into my beautiful dress knowing I had a little more wiggle room in it. I had no trouble making up that wiggle room by eating more of the delicious food and cake! I had soo much fun taking my freshly wrapped self onto the dance floor to celebrate our big day!!! The Bride-to-be and I a few days before her big day!